What paper should you use for a resume? It takes less than 5-minutes to make a good first impression in a job interview. Good paper alone won’t land you the offer letter, but it will help you stand out from the competition. 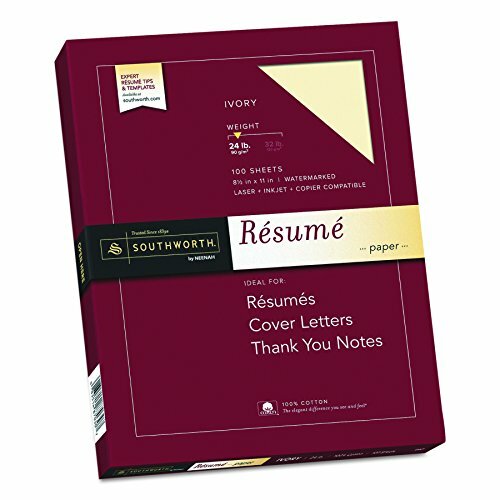 Here are 3 things to keep in mind when selecting resume paper. The weight, texture, and color of good quality premium paper are just a few features to keep in mind. We have listed some of our favorite paper products below. In our opinion, weight is the one area you can splurge. Paperweight refers to the thickness and sturdiness of the paper and is not the actual weight of the paper. Specifically, it represents the weight of one ream (500 sheets) of paper in its basic unit uncut size. Paper weight can range between 20 lb - 80 lb. The 20 lb weight is typically seen in your everyday copy paper and 80lb used mostly for business cards. In our opinion, 32 lb is enough to let them know you mean business without looking like you are ‘trying too hard’. 20 lb paper felt like turning in a college essay, but any heavier than 32 was a bit ‘overkill' and pricey. Color is the next variable to consider. Definitely stay away from vibrantly colored resumes (blue, red, green etc.) as they are too distracting and will land you a spot in either the recruiter trash bin or ‘wall of shame’. One thing to note is that colors such as ‘ivory’ may make your resume seem aged or yellowish. This is personal preference but we preferred to stick to simple, plain, white (or ‘off white’) colored paper. Texture refers to the material being used. The most common types of material you will find are linen and cotton. Our team prefers cotton over other materials as a safe bet. Linen can make your resume seem ‘grainy’ and also aged like a Dead Sea Scroll. We still want the resume content itself to be the focal point and prefer not to choose a distracting texture. We hope these tips help you land that next step of your career. After testing several reams, our top pick for paper is listed below. 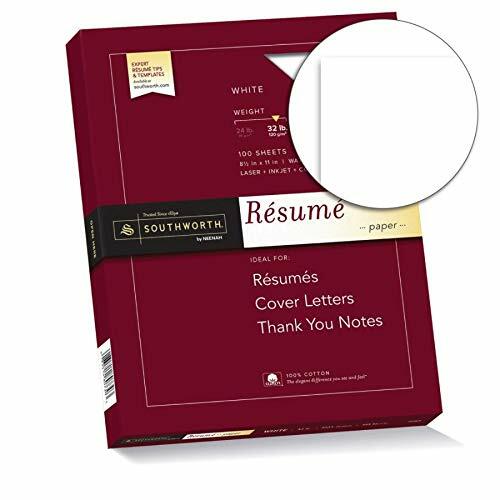 A fair price and solid specs make this our “go-to” paper for resumes and professional documents. After testing several products, this paper ended up being our favorite. The 32 lb weight set the test page apart from other paper we tried, The white color did not look “yellowish” in the office lighting, and the texture was instantly noticeable but not distracting. If there was one thing to improve it would be the watermark. Watermarks are a sign of good quality paper, however, some customers may prefer their resume without one. This 24 lb Ivory paper also from southworth was our runner up. The pricing compared to other brands and the mix of quality texture/weight makes this a great pick. It lacks in some areas but it will absolutely help with getting the job done and save you money while you are at it. After shopping all over Amazon, this paper was our runner up. The cost was very affordable for a high quality cotton paper. You still receive the texture as our number 1 option and it prints just as well. If you don’t mind the ivory coloring this will do just fine! Personally our team was not a fan of the yellowish color ivory but to others this may give a more ‘distinguished’ allure. The watermark on Southland paper is also seen on this product. Lastly, the weight is just a tad less noticeable compared to the 32 lb. However, for this price and quality, we couldn’t find a better deal on Amazon.